My favourite Icelandic snack is ‘harðfiskur’. 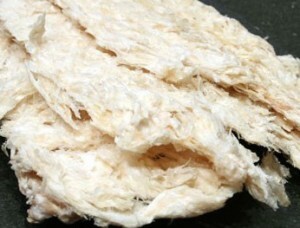 It is wind-dried fish, usually cod, haddock or seawolf. It’s been beaten until it has softened somewhat, and it’s absolutely delicious served with butter. ‘Harðfiskur’ is a very healthy snack, very rich in protein. Each bite has to be chewed thoroughly and it may take some time to get used to. Don’t let the smell scare you away from trying it. ‘Harðfiskur’ smells of ammoniac so that’s quite horrible as you can imagine. In the past, ‘harðfiskur’ was eaten instead of bread in homes that couldn’t afford flour for baking on special occasions. Nowadays however, ‘harðfiskur’ is unfortunately very expensive and regarded as a luxury product in Iceland. ← Celebrating Dame Helen Mirren!